The fourth step to my Mystery Quilt-Along is finally done thanks to the low humidity of the past couple of days during which time I spent many hours happily playing in my upstairs sewing studio. After Step 4, the quilt top should measure 66 1/2" long x 62 1/2" wide. We're getting there! I decided on a French braid border and for those of you who have never made one, you'll find that it is surprisingly easy to do. Below is one of the many links I found on how to go about constructing a pieced French braid. And just click HERE for the link to the downloadable PDF file containing the photo and instructions. Have fun and we'll see you 'soon' with Step 5. 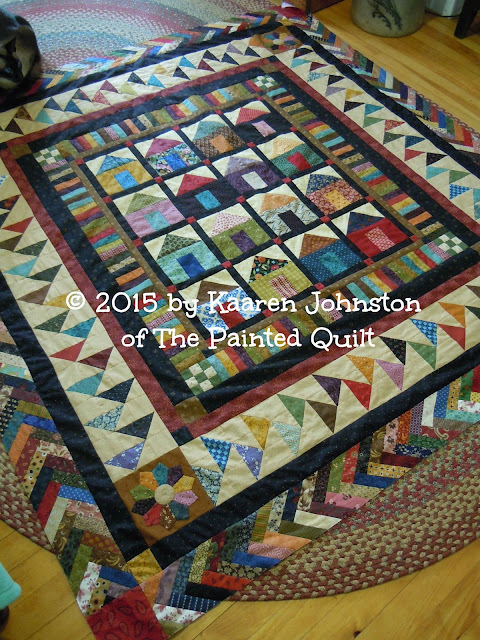 Kaaren, your quilt is beautiful! Love seeing the braided border added to the centre. Gorgeous! Just gorgeous Karen, wonderful desing. Absolutely beautiful. The braid adds a real depth to the whole design. The wandering geese and braid borders really give it movement! I love that, you need to put into a show some where. It would win! Kaaren, I LOVE, LOVE this. I am always drawn to "neighborhood" house type quilts but this one is really striking. I like the primitive color scheme and the wonderful staggered flying geese. Great job as always. Thank you so much for the beautiful pattern Kaarin. I'm one step behind, but I will get caught up! Looking wonderful! I hope you are getting some of this cool air we are enjoying in Maine this morning! I love your quilt and your blog! Thanks for sharing your gorgeous design. I love the colors of the fabric you are using! I would stop where you are. The single color border really makes it pop - just as is :) Great job - a beautiful beautiful quilt! I would love to know what the additional step would be. I would be happy making it larger, but will love it even if you stop where you are.